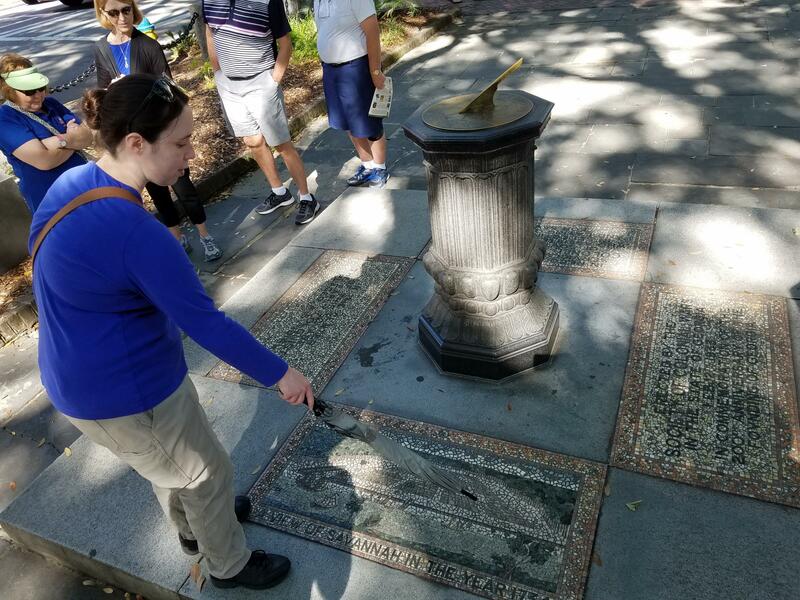 Tour guide Bonnie Terrell explains Savannah’s historic street plan a grid broken up by parks called “squares” — with the help of a mosaic in Johnson Square. 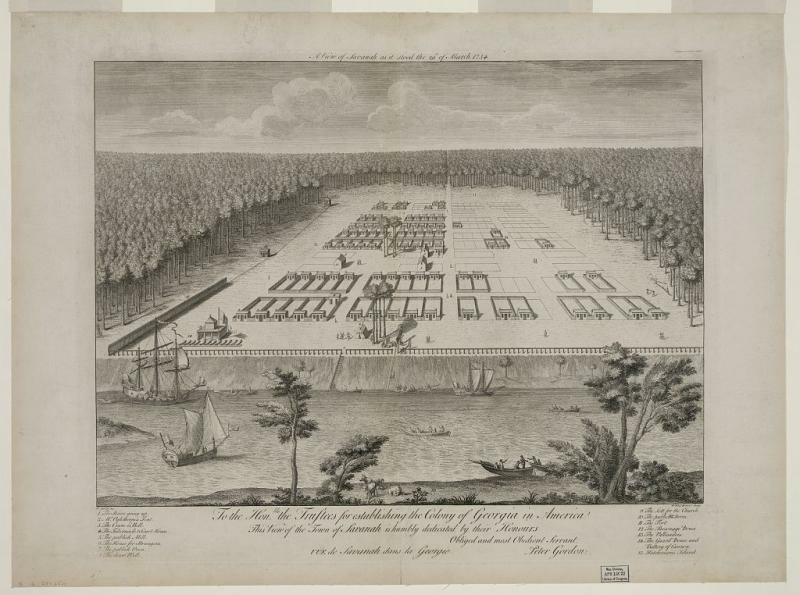 A view of Savannah dated 1734 shows Oglethorpe’s original plan for lots arrayed around open squares. It's the basis for the Johnson Square mosaic. A parking garage and municipal office loom over the otherwise well-preserved Oglethorpe Square. 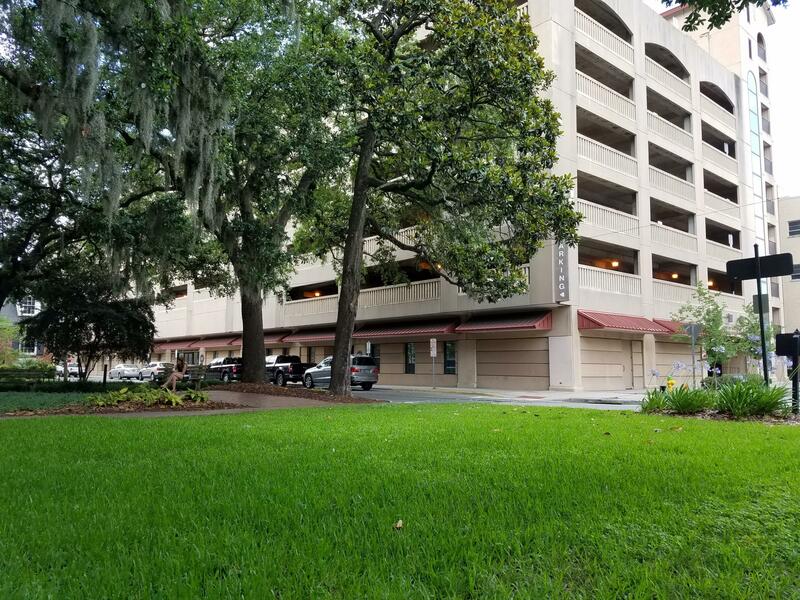 Instead of a street and twin trust lots (originally meant for public buildings like churches and banks), Orleans Square gives way to the Savannah Civic Center and its parking lot. 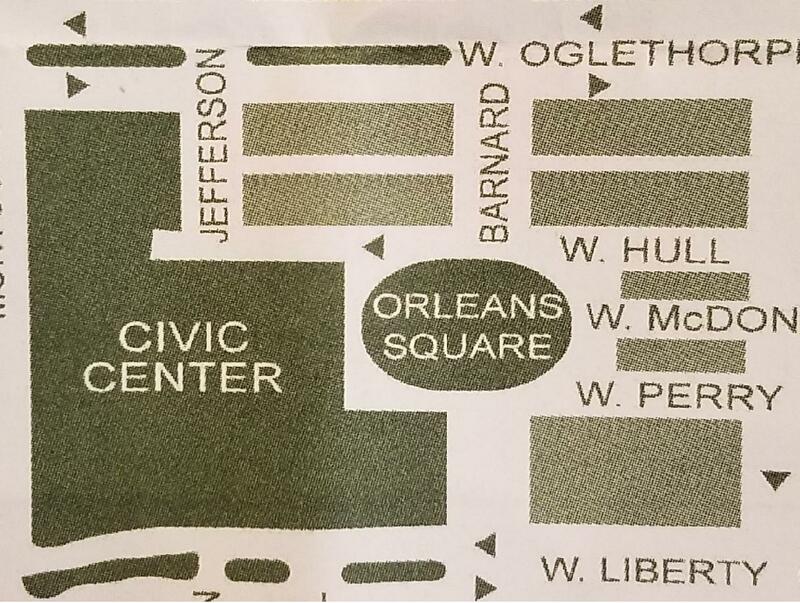 A free map for tourists shows how the Civic Center complex eliminates the Oglethorpe plan around Orleans Square. Not all new construction interrupts the plan. 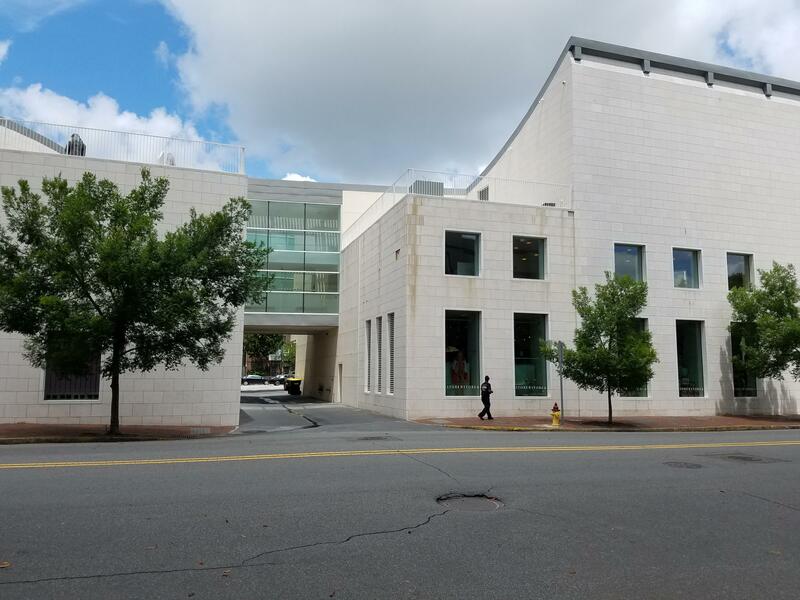 The Telfair Museums' Jepson Center bridges its lane with an elevated walkway. 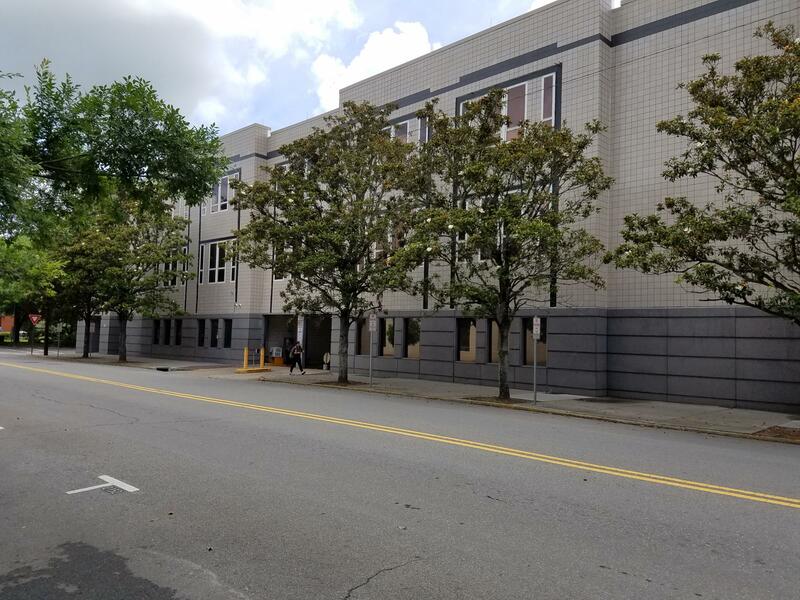 Across the street, a federal building is built over the same lane. 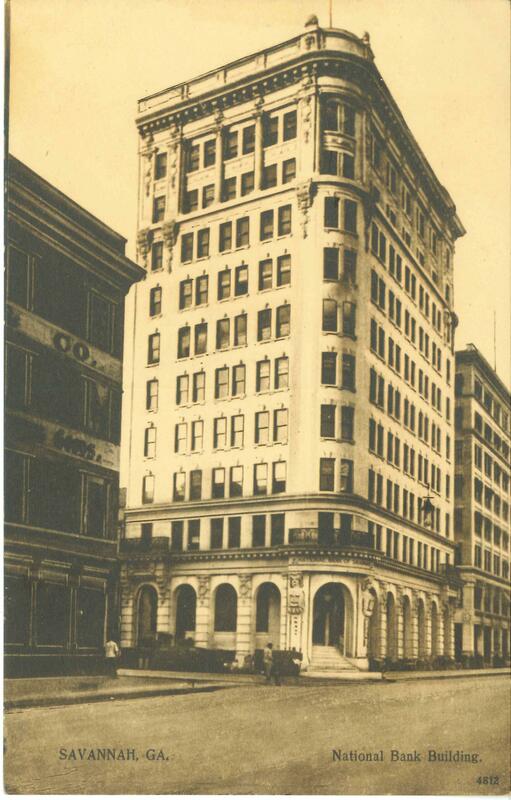 The corner of Bull and Broughton, at the heart of the downtown retail corridor, was once home to the National Bank building. 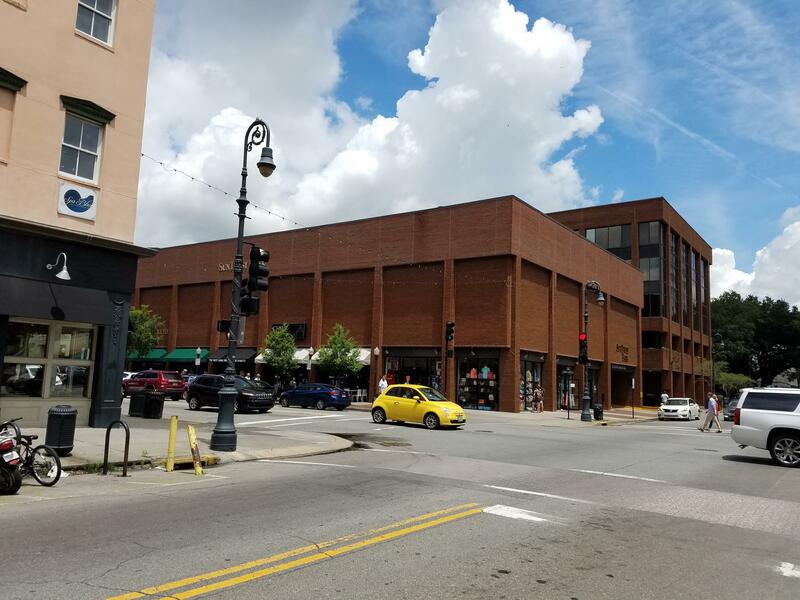 Today, a pahrking garage with first-floor retail space, and a SunTrust bank beyond, occupies the corner of Bull and Broughton. This historic view of Bay Street, with City Hall in the foreground, shows the brick buildings that once lined the street. Trees obscure the hotel that now sits next to City Hall, better seen from the river (see next slide). The Hyatt Regency, which opened in 1981, is built over the historic cobblestones of River Street and stretches back to Bay Street behind. A traditional residential block in Savannah has townhouses facing the street and garages known as "carriage houses" facing the lane, separated by a courtyard. On streets that follow the convention (including newly-constructed ones like this), the open courtyards afford a view the length of the block. Many properties have built into the courtyard, interrupting the historic layout. Probably the best way to experience Savannah is the way a lot of locals and tourists do — on foot. 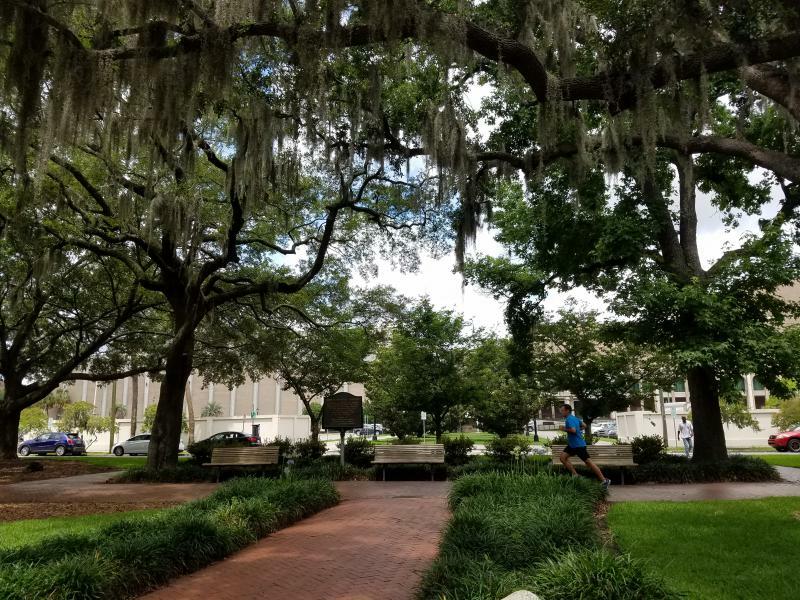 On a recent Saturday morning, guide Bonnie Terrell told her walking tour group that to understand Savannah, you have to understand James Edward Oglethorpe. He founded the Georgia colony and designed this city. "He planned the usage of all the space in the city," Terrell explained with the help of a mosaic showing the original town plan. "He was very meticulous, even down to the use of the lots and the width of the streets." 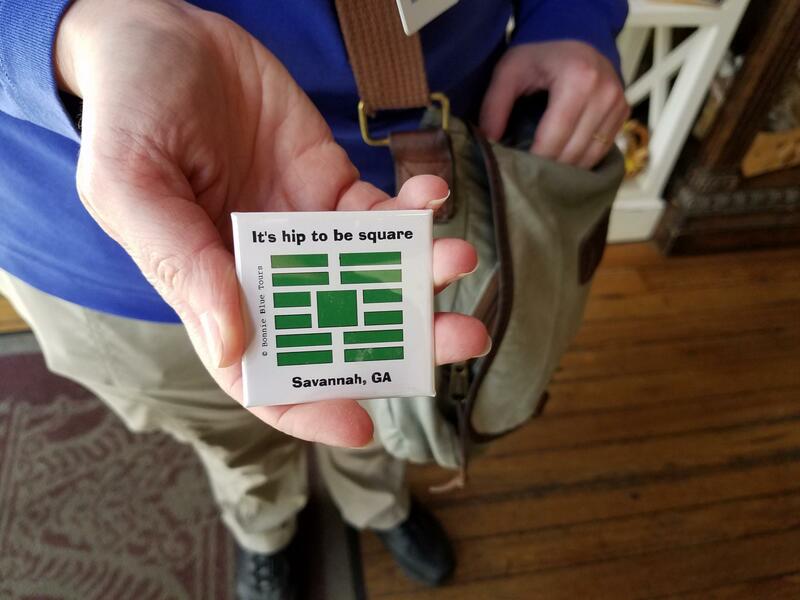 A button shows the basic layout of Savannah’s historic squares and the lots around them as planned by founder James Edward Oglethorpe. The streets run in a grid, broken up by open space with grass, walkways, and fountains. Locals call them squares. A mix of public buildings and homes surround the squares, with alleys known as lanes running behind. "So even the lanes are part of our original plan," Terrell explained. "Sadly they've been built over in various places." And that’s where trouble comes in. A substantial part of downtown Savannah is a national historic landmark district. That means the federal government considers it significant to the country’s history. A recent study recommends listing the district as threatened — sort of like an endangered species. The biggest threats? Development that’s too big and erosion of Oglethorpe’s plan. The Savannah Civic Center complex has paved over the historic street plan at Orleans Square. 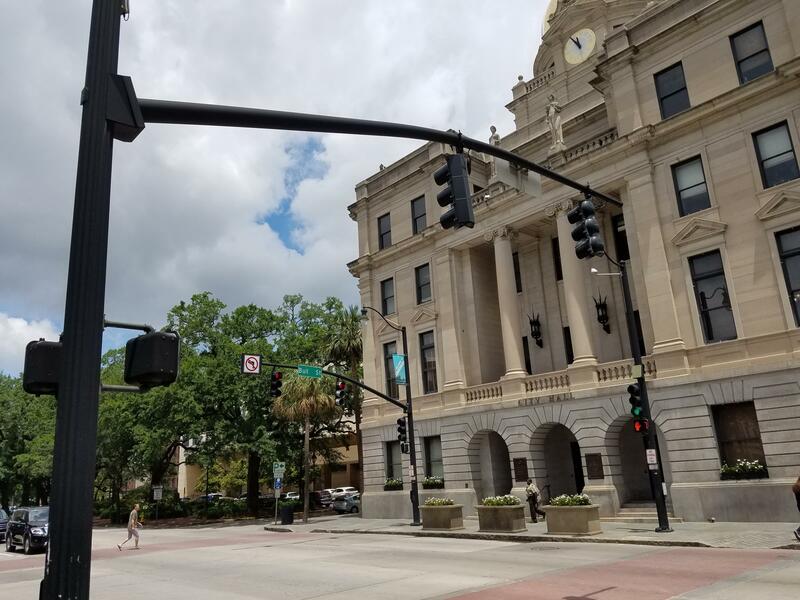 "I think Savannah is a victim of its own success," said Ellen Harris, who directs historic preservation for the city's Metropolitan Planning commission. "Because we have so many tourists, we need to have facilities to accommodate them. That leads to new hotels and larger hotels. And I'm not just picking on hotels; we have other large-scale developments," Harris said. 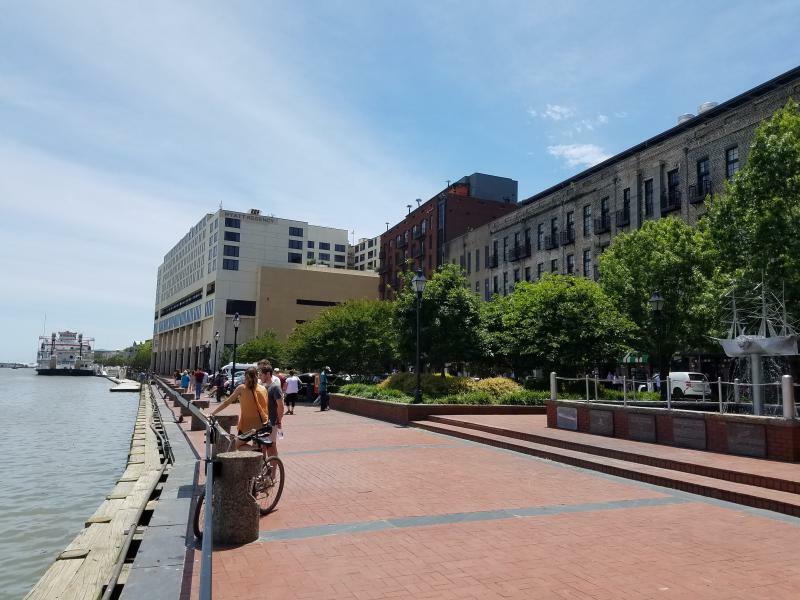 But hotels are some of the most visible new projects in that area; more than a dozen are in some stage of planning or construction, according to the new report. And there’s a paradox here: Hotels come to town because the historic district attracts tourists and historic preservation tax credits. 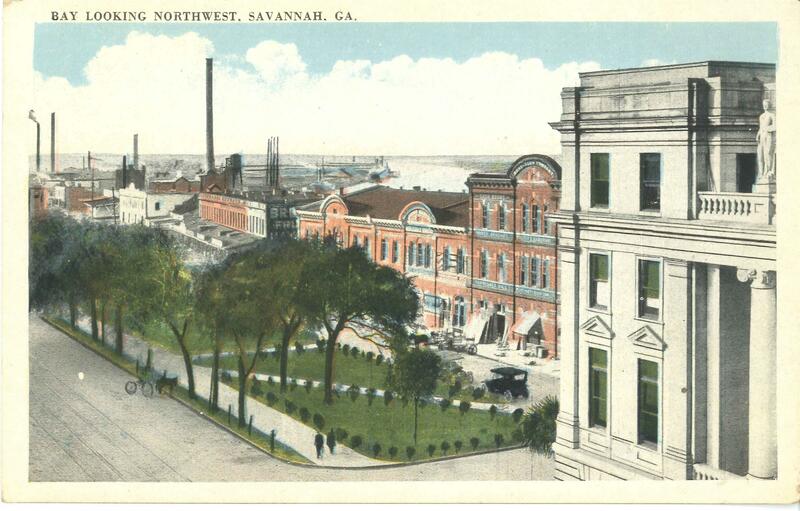 Developers like Richard Kessler use those credits to adapt and preserve Savannah buildings. "It motivates people like us to say 'OK, let's take this on,'" Kessler explained. The idea is that without that incentive for developers, historic buildings would fall into disrepair. 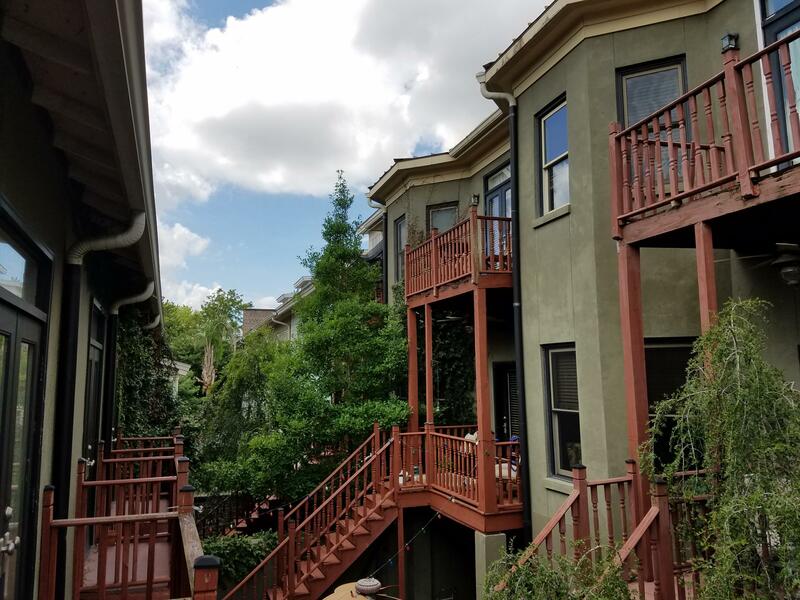 But critics say some developers still get away with making too many changes — building a little higher, a little bigger, a little closer to the sidewalk. Kessler has gotten some allowances for his hotel projects, but he said others have gone further. "You've got a diamond here to work with," said Kessler, the developer. "It's a beautiful city. And if we do the right thing, we can make it more beautiful and make it more livable." Two new hotels under construction near Savannah’s riverfront. Both Rockbridge Capital’s project (left) and Richard Kessler’s (right, adapting an old power plant) got permission to build taller than the city’s height map calls for. 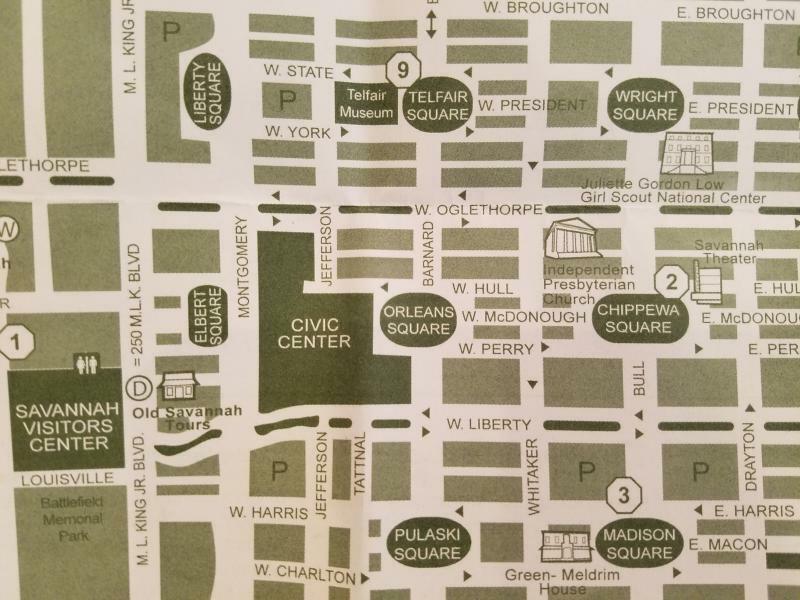 This map shows buildings constructed before 1966, when Savannah's National Historic Landmark District was designated, and those built after. "Could we have pushed for another floor or two or three? Yeah, we could have. 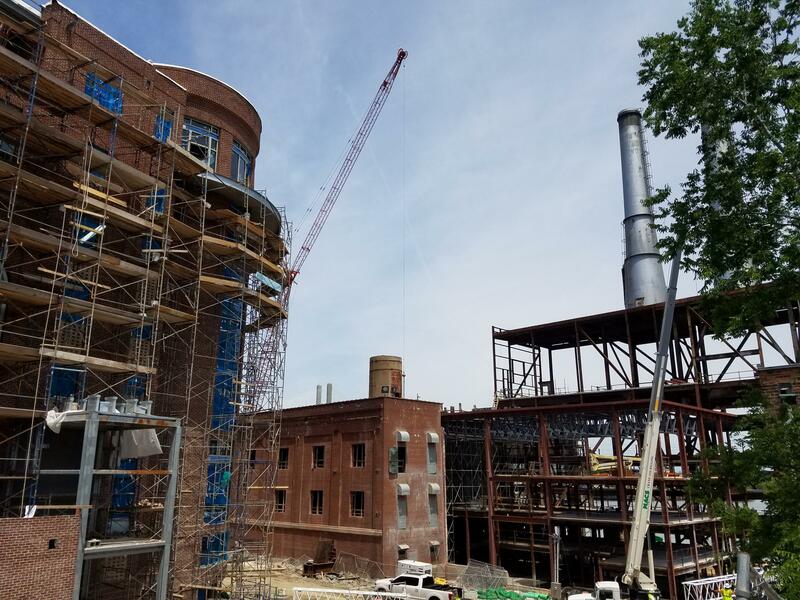 And we could've probably got it," he said of his current project converting an old power plant into a hotel. "But I think from a design point of view we didn't think that was the right thing to do. Historic Savannah Foundation president Daniel Carey said every change — big or small — matters. 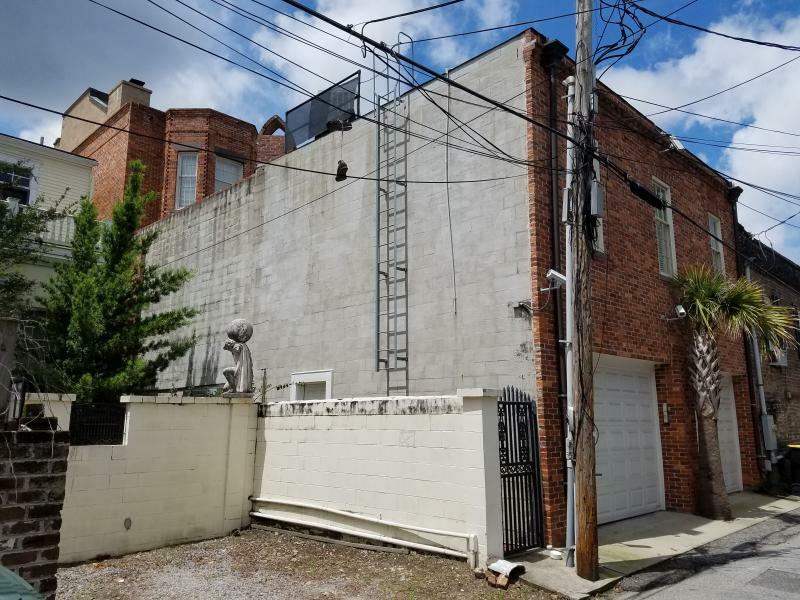 "Cumulatively, if you start saying, 'Well no, we're going to allow taller buildings, and we're gonna cut some corners on Oglethorpe's plan,'" he said, "those things do start to add up." The question is whether enough changes have added up to endanger a unique historic city. Because that’s where everyone agrees: Savannah is special, and worth preserving. 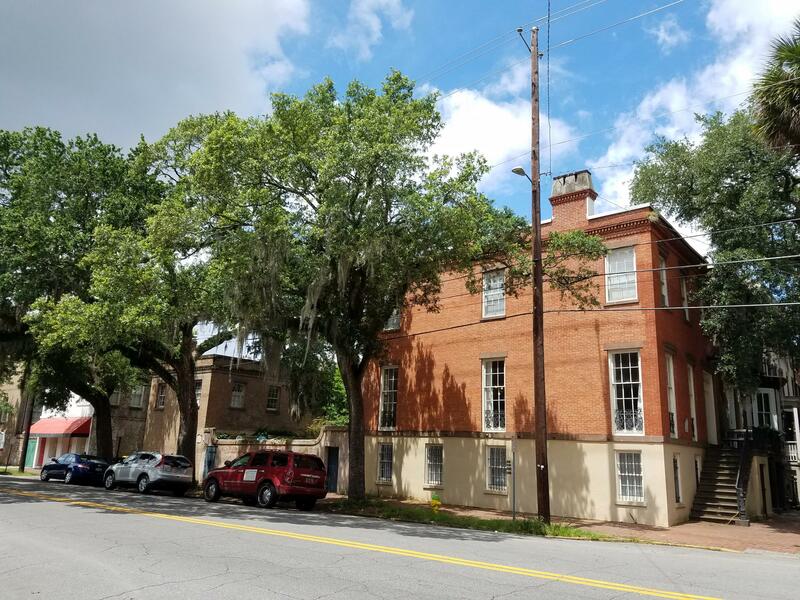 Developers and preservationists agreed the key is finding the right balance between Savannah’s past and its future. The National Park Service is taking public comment through June 30 on whether the historic district should be listed as threatened. That change would hurt Savannah’s image as a historic destination. But Carey said the report has already done its job. "Really regardless of what the Park Service says," he said, "this report says we need to do more, we need to do better and we need to take this pretty seriously."